Your cell beeps, and a text message duly arrives requesting you to collect your new passport from the passport office nearby. Such a text message, quite earlier than the due date, might come as a surprise. Being a citizen of a country like ours where it is hard to get things done, and harder to get them done in due time, you might not have a passport as you are indifferent to its necessity, or you might be sitting idle even after its expiry date or you might fear the inevitable hassles which are associated with the procedures of getting a passport. But the good news is, for a new passport, you don't have to even wait long. You can get it very much in time, without paying the brokers any extra bucks or taking favours from an acquaintance in the passport office. The government will soon stop issuing manual passports and switch to MRPs. Machine readable passport (MRP), with a number of new security features, is definitely a step forward to digitalis-ation and the whole new arrangement to get a new passport is very well-organised. What one has to do is simply file in a form with the information asked, deposit the registration fee and wait for a very reasonable time (15 days for 'regular' and three days for 'express') to get the new MRP in hand. A new passport form has been designed for issuing MRPs which is available at passport offices or can be downloaded from the official website of Department of Immigration and Passport, DIP. 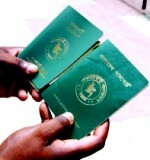 While applying for a passport an applicant should have a photocopy of his/her national ID card or birth certificate and two copies of passport size photographs. The documents must be attested before submission. The passport office starts its work by enrolling the application for registration. During the registration phase the passport office will obtain additional live photograph, signature and thumb print of the applicant and complete the registration and give the applicant a collection slip mentioning a date for obtaining the passport which is subject to police verification. Police verification, conducted by the Special Branch (SB) of police, is mandatory for anyone who is obtaining a passport for the very first time. But if it is about re-issuing the passport, police verification is not required. For the project for issuing MRPs, around 200 officers at the SB are given training to conduct the verification procedure and give their inputs to the online database of the immigration department. After the verification is over, the fresh passports are printed and the expectant passport holder is notified through an SMS or email. The passport office is currently notifying through text messages. If a person wants a fresh MRP within 10 days (the time might vary a little for the verifications) he or she will have to pay TK 3000 where an urgently needed passport can be obtained within 24 hours at TK 6000. Applicants can apply for passports and collect it from the divisional passport and visa office along with the regional offices across the country. The MRP book is printed centrally at Agargaon passport office. After printing they are sent to the respective offices of different regions and to the Bangladeshi missions abroad. According to an official of Department of Passport and Immigration, MRP service has been launched in 25 of the 34 regional offices and the rest of the offices will be equipped with the service in three months. Applicants can collect passports from the divisional passport and visa office along with the regional offices across the country. In the manual passport all the particulars and information of the passport holder are handwritten. This handwritten feature makes the passport vulnerable to the risk of distortion or forced changes. But the information and photograph of the passport holder in the case of MRP is all printed on a thin paper which cannot be distorted; besides the photo cannot be delaminated or pasted. “The handwritten passport earlier did not have any database like now we have for MRPs,” says SM Nazrul Islam, Deputy Project Director, Introduction of MRP and MRV (Machine Readable Visa) in Bangladesh, DIP. He also says that in the old system there is scope for a passport holder to hold more than one passports, but now the new central database system is protected from any kind of forgery. Again, the handwritten passport has less readability, which takes a lot of time in the immigration check posts. Bangladeshi Passport holders with manual one need much time at most of the immigration check posts worldwide, which are mostly familiar with MRPs, Nazrul thinks. The new and more credible MRP for the Bangladeshi nationals, hopefully, will save a lot of time. The government will soon expand its service to issue MRPs for the expatriates through its 65 missions worldwide. Five of the missions are already being introduced to this service. Further MRP will be launched at Bangladesh consulates in Beijing, Ottawa, US, UK, South Africa, and Hong Kong very shortly. The new MRP has two kinds of information in its data page, one is easily readable by any person and other is readable only by a machine. The machine readable part is encoded in Optical Character Recognition (OCR) language that can be decoded only by a particular machine. Such design can easily detect any attempt of forgery. Moreover, the new MRP has a total of 37 security features. Of them, 25 features are present throughout the entire MRP book and other 12 security features are there in the laminated data page of the book. 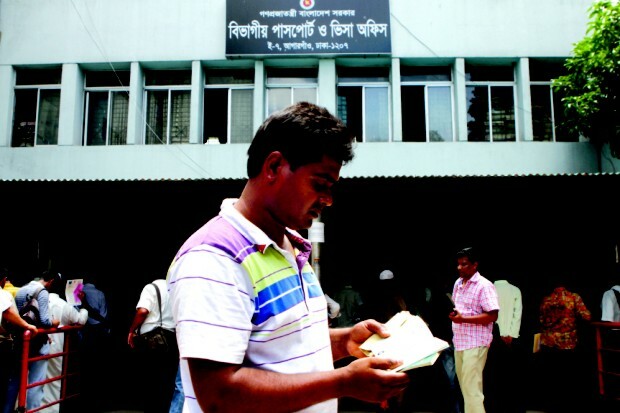 The government has introduced Machine Readable Passport in the country and has launched a project to issue MRP and Machine Readable Visa at the Department of Immigration and Passport, Agargaon in the city in April last year. So far a total of 4, 20,000 MRPs have been issued and 42,000 more are in the pipeline. The department will gradually convert existing 1.3 crore passports into MRP. The government will stop issuing manual passport very soon as the country is one of 190 member countries of the International Civil Aviation Organisation (ICAO)who have pledged to switch to MRP by 2015. By this time anyone having manual passport will need to convert it to the MRP. For the conversion the passport holder will have to apply for a fresh MRP passport. The new passport will carry references from the old passport. As the government has also launched MRVs, soon all kinds of visa will be given in MRV format. At that time the manual passport will no longer be working. If you have a manual passport with a number of blank pages or a passport soon to be expired, fear not. A new MRP is only days away.